December 04, 2010 - Sikorsky Aerospace Services (SAS) announced the delivery of the first upgraded S-61 helicopter to the U.S. State Department. With its history of reliability and safety, the Sikorsky S-61 helicopter is capable of performing a wide range of critical missions including medical evacuation, passenger and logistics transportation. The Sikorsky S-61 is a civil variant of the successful SH-3 Sea King helicopter. 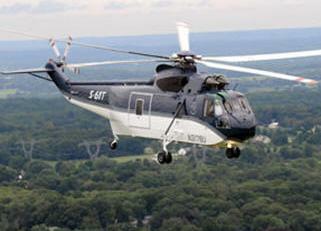 They are two of the most widely used airliner and oil rig support helicopters built. A unique version is the S-61 Shortsky conversion of S-61Ls and Ns by Helipro International. VIH Logging was the launch customer for the HeliPro Shortsky conversion which first flew in February 1996. One modification for the S-61 is the Carson Composite Main Rotor blade. These blades replace the original Sikorsky metal blades which are prone to fatigue. The Carson Composite Main Rotor blades permit a modified aircraft to carry an additional 2,000 lb (907 kg) load, fly 15 kn (28 km/h) faster and increases range 61 nmi (113 km). The latest version is the modernized S-61T helicopter. The US State Department has signed a purchase agreement for up to 110 modernized S-61T aircraft for passenger and cargo transport missions in support of its worldwide operations. The first two modernized S-61 aircraft will support missions for the U.S. Embassy in Afghanistan. ?This delivery marks another significant milestone for the Sikorsky S-61 helicopter program and speaks to the continued success of the aircraft?s upgrade program launched earlier this year. The S-61 helicopter continues to be one of the most dependable and best value aircraft in the aerospace industry,? said David Adler, SAS president. To date, purchase orders for 17 aircraft have been placed by the DoS for use in locations throughout the world. The S-61 helicopter has established a reputation as a reliable and mission-capable helicopter. The upgrade program incorporates advancements in state-of-the-art technology that launches this long-proven aircraft into the twenty-first century. The upgraded S-61 helicopter includes a full array of system upgrades for enhanced mission performance. Composite main rotor blades (CMRB) provide improved functionality in hot/high conditions. Additional features have been incorporated to reduce pilot fatigue and maintenance requirements for increased safety. The upgraded S-61 aircraft offers its operators an affordable purchase price, economical operating costs and intrinsic resale value. Four aircraft are to be delivered in 2010, with deliveries of the next 13 upgraded S-61 helicopters scheduled throughout 2011. Sikorsky Aerospace Services, a Sikorsky company, provides comprehensive support to rotary and fixed wing operators around the world. It offers its military and commercial customers a full portfolio of support services, including material distribution, maintenance, overhaul & repair, aircraft modifications and life-cycle support.